After the First World War, the architectural profession was formally organised with the formulation of Singapore Society of Architects in 1923. This body was eventually successful in having the Architects Ordinance passed in 1926. By January 1927, the architectural profession was protected under this Ordinance. In 1930, a branch was formed in Kuala Lumpur. In 1931, the body was renamed the Institute of Architects of Malaya, with Headquarters in Singapore. The Institute of Architects of Malaya was dissolved in 1961. In 1949, the Kuala Lumpur branch became an autonomous body – the Federation of Malaya Society of Architects. In 1958, the Society of Malayan Architects was formed, which was reconstituted as the Singapore Institute of Architects in 1961. SIA was registered under the Societies Act on 5 March 1963 and gazetted on 15 March 1963. The SIA held its first EGM on 14 April 1961. Established with the objective to promote architectural profession and the built environment in Singapore the Institute is the sole representative of the architectural profession in Singapore. In 1966, SIA began publishing technical news related to the building and construction industry, in its official publication – the Singapore Institute of Architects Journal. This was followed later by similar articles in the SIA Yearbook. 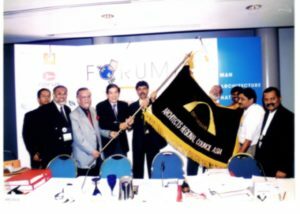 The formation of ARCASIA (Asian Regional Council of Asia) was first mooted in 1967 at the Commonwealth Association of Architects (CAA) in New Delhi. This was in respond to an urgent need to organize a regional center to look into environmental design, information, research and education in Asia and to foster unity among the six Asian Member Institutes of CAA. The six Institutes comprised HKIA, IIA, IAP, SIA and SLIA and SIA Past President Datuk Lim Chong Keat was the Founding Chairman for ARCASIA. By 2000, ARCASIA had grown to a 17 member institutes. In August 1969, a “Retrospective Exhibition of the Urban Environment” was held to commemorate the 150th anniversary of the founding of Singapore. The SIA officially launched the SIA Building Centre project. Momentum gained. In early 1975, Planning Approval was obtained, followed by Building Approval in mid-1975. By November 1975, work began on the construction of the Building Centre. Culminating ten years of planning and effort, SIA Building Centre was completed on 1 April 1976, and officially declared open by Dr. Tan Eng Liang, then the Senior Minister of State for National Development. In February 1977, 100 projects were selected from more than 200 entries for a full-scale architectural exhibition under the theme “The Architects and the Built Environment”. SIA published the “Articles and Conditions of Building Contract” which has been widely used in the building industry. In 1981, SIA produced a book, titled “rumah”, which traced the history of architectural development in Singapore as well as keeping a record of the works of SIA members over a period of time. It covered the one-and-a-half decade to 1981, which was an important period of the physical development of Singapore. In February 1983, SIA organised an exhibition and conference under the theme “The Role of the Singapore Architects in the 80s and Beyond”. Concurrent with the exhibition, the 1st SIA Architectural Design Award for outstanding design was launched. “Conditions of Appointment and Scale of Professional Charges” an agreement between the Architect and Client was published. The Micro Design Awards was implemented in 1986 to recognise and promote excellence in architectural detailing in the design. In 1988, Mr. S Dhanabalan, then Minister for National Development, opened the new premises for the SIA Secretariat and Building Centre at SMA House. SIA hosted the 16th ARCASIA Council Meeting and Forum 8 at Westin Stamford. 1995 also saw the implementation of the SIA-Industry Series of awards/competition. The first was the SIA-Hunter Douglas Design Competition, which aimed to encourage the creative and innovative use of Luxalon products and aluminium as building materials. Another industry award launched this year was the SIA-ICI Colour Awards to promote the creative use of colors in Singapore landscape. In 1997, the Institute introduced the “Friend of Architecture Award” to recognise organisations which have contributed continuously to the Institute and the profession over a period of at least 3 years. 1997 also saw the formation of Construction Industry Join Committee (CIJC), a private sector initiative, to provide quality feedback to government on policies reaction or problem facing the industry. ACES, IES, REDAS, SCAL, SIA, SIBL and SISV were the CIJC founding members. In 1998, the Institute published the “Contemporary Singapore Architecture”. The book traced the development from 1960, covering the better architecture works by members over the past four decades since the 1960s, featuring buildings that the Institute believed had added to the country’s short but rich heritage in the built environment of Singapore. The SIA-HWA Joint Awards for Handicaps-Friendly Buildings (renamed to SIA-HAW Joint Awards for Community-Friendly Buildings) was also implemented in 1998. There are two objectives. One is to promote the awareness of the public that provision of suitable access facilities can help towards greater independence of the elderly and disabled persons in their everyday lives and their integration with the community. The 2nd objective is to encourage and recognise developers and architects for their initiatives and forethought in providing such facilities. 1998 also saw the inauguration of the Gold Medal Award for lifetime contribution to architecture. The highest award of the SIA, the recipient must demonstrate achievement of sustained and substantial work of architectural excellence and the promotion of the advancement of architecture. He/she must have attained a respected professional standing in society, with personal integrity and be an “ambassador” of the profession. He/she must also demonstrate leadership qualities that provide direction for and enhance prestige of the architectural profession as well as serve as role model that will inspire other architects to emulate. The first SIA Gold Medal Award recipient was Mr. Alfred Wong from Alfred Wong Partnerships Pte Ltd. In 1999, the Institute acquired its own premises at 79 Neil Road and physically moved in to the new premises in July 2000. The Building was officially opened by Mr. Mah Bow Tan, Minister for National Development on 15 March 2001. SIA hosted ARCASIA Forum 11 in September 2000 and the theme for the forum was “Man, Architecture, Nature”. In 2001, the SIA Façade Awards for Design Excellence was introduced with the objective to encourage the innovative use of materials for external cladding. SIA was appointed in 2002 as agent for BOA to manage the BOA-SIA CPD Programme. This CPD requirement is for the renewal of Practising Certificate This requirement started with a trial run in 2002 & 2003 and became mandatory for the renewal of Practising Certificate in 2004. In 2004, SIA hosted the inaugural UIA Regional Forum and UIA Bureau Meeting at Biopolis. The theme for the forum was “Sustainability. Mobility. Identity”. To review the state of the architecture profession, consolidate our concerns and strategise to chart the course for the development of our profession for the next decade, SIA formed a taskforce in 2004 to draft a Blueprint for the Architecture Profession. 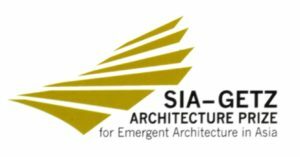 SIA and Getz Bros & Co. (S) Pte Ltd launched the “SIA-Getz Architecture Prize for emergent architecture in Asia” in 2005. The biennial prize honours an architect who has significantly contributed to the progress of architecture in Asia, much as the Pritzker Prize has for the worldwide community of architects. 2005 also saw the Institute taking the lead to organise, on behalf of MICA, the Singapore Pavilion for the Biennale Sao Paulo, an exhibition showcasing the theme, “Living in the City”. A publication 699.1 was published in conjunction with exhibition. In 2006, as part of the private industry effort to provide assistance in the rebuilding phase of the tsunami hit areas, SIA under CIJC collaborated with Singapore Red Cross to focus on the rebuilding efforts in Republic of Maldives and Sri Lanka. As part of this aid-programme, a 4-storey Singapore School at Hulhumale was completed in 2007 and the refurbishment of 3 schools in the district of Hambantota, Matara and Galle were also done in 2008. The inaugural ArchiFest was held in November 2007 for the city to celebrate the built environment. The main aim of the festival is to provide a platform to breed of a vibrant design culture, and consequently a design conscious society, by encouraging and guiding the general public and design professionals of all fields to interact in a fun and free atmosphere. At the 23rd UIA World Congress in Turin, Italy, SIA, with the support of the Ministry of National Development (MND), Urban Redevelopment Authority (URA) and the Singapore Tourism Board (STB) submitted its candidature to host the UIA World Congress, General Assembly and related events in 2014. Singapore lost the bid to Durban, South Africa. PUSH Award was launched at the SIA Annual Dinner to recognize and honor the “Best of the Best” from the design sector who are pushing design to its limit, to stretch creativity, imagination and breakthrough and reach greater height. 2009 also saw the formation of the SIA Young Architectural League to represent the voice of the younger group of members. In 2010, SIA was commissioned by the Government (through Design Singapore Council) to lead, manage and execute the Singapore’s presentation at the 12th Venice Biennale International Architecture Exhibition (VBIAE). This is the first time that a private organisation is taking the lead in the Singapore’s presentation at Venice Biennale, which hitherto had been undertaken by MICA itself. A book, titled “1000 Singapores” was also produced to augment the presentation. 2010 also saw SIA released a position paper on “Attributes of a Sustainable Built Environment”. The position paper articulated the architect’s approach to a sustainable built environment. Implicit in these attributes is a multi-disciplinary, multi-stakeholder, whole-life perspective, reflecting the complexities of how the built environment is managed from concept to end-of-life. Another highlight of 2010 was the acquisition of the adjacent unit 81 Neil Road upon an approval from the general membership at an EGM held on 22 November 2010. This purchase was completed on 8 February 2011. With the support from URA, DSg and STB, the Institute has submitted its candidature to invite UIA to host the 2017 UIA World Congress in Singapore. The bid presentation was held in September 2011 in Tokyo. Singapore lost the bid to Seoul, South Korea. 2011 also saw SIA organized 3 design competitions for MUIS for the A&A Al-Ansar and Punggol Mosques and for National Heritage Board for the Indian Heritage Centre. Such competitions attracted many submissions, and had benefited our member firms; two of these design competitions were won by small and medium-sized firms. In 2012, the Minor Works Contract was completely revamped, updated to reflect current operating environment with more comprehensive content, and is user-friendly and easy to use. 2013 was a year of major significance for SIA as we celebrated our Institute 50th anniversary of establishment. Various events and activities commemorating this milestone took centre stage during the year, some of the key and particularly meaningful ones included – 50th Anniversary Gala Dinner held on Friday 17 May 2013 at the Resorts World Sentosa Compass Ballroom. Launch of “I AM ARCHITECT” campaign at the Anniversary Dinner where the video, “I AM ARCHITECT” was shown. This campaign was reinforced through the launch of the new SIA Website, social media, SIA Newsletter, as well as a “I AM ARCHITECT” ST Supplement. In addition, this video was shared at the Arcasia event in Kathmandu, and received popular feedbacks and multiple requests from Arcasia Institutes to reuse for their institute’s promotion of architecture and the architectural fraternity as a whole. Production of a SIA 50th Anniversary Book titled “RUMAH”, which stands for “Review of Urbanism, Modern Architecture & Housing”. This publication documents the 50 years story of Singapore Architectural Profession as it evolved from its roots during the colonial period, through the nation building phases of Singapore, to how the profession confronts current challenges of a globalised urban environment. Launch of SIA New Website, which was re-vamped to enhance its user-friendliness, enabling greater ease of navigating and locating relevant information regarding the institute and its activities. Launch of Singapore Architects, SA Website – which capitalises on the digital platform to extend its reach to the international audience. The Website is able to collectively present SA articles across a library of architecture related topics and projects relevant to local architects. The refreshed web interface is also intended to share latest architectural information and news immediately with its readers, with online subscription also made available on the website. 2013 also saw the launch of the G-Architect (Green Architect) Award implemented together Uniseal Pte Ltd, in October 2013, to honour and bestow annually an Asian architect. The G-Architect is an individual who, through his or her body of built and/or theoretical projects, advances and advocates the theory and design practice of sustainable architecture. Mr. Leung Man Kit, Director of Sustainable Design, Ronald Lu & Partners (HK) was the first recipient for the Award. In order to address problems faced by the architectural fraternity in architectural detailing, a new programme, on Architectural Detailing and Specifications Course (ADSC), was launched in October 2013. This Course aims to raise the general awareness and standard of architectural detailing in the profession, in particular among younger architects. ADSC comprises 12 sessions. Hitherto, 30 participants had undertaken the training. After extensive deliberation, Council decided to embark on a major renovation of SIA premises integrating units 79 and 81 into one bigger combined space. This will lead to more effective utilisation of the 2 units. Through an open design competition, DP was appointed as the architect for the renovation works. One salient feature of the renovation is to create affordable space for use by young architects embarking on their career. The Theatrette will be located at the 3rd storey, SIA Secretariat office will be at 2nd storey and the ground floor will be for rental. There will be a platform lift for use by those with lesser mobility. The renovation is projected to be completed by August 2015. September 25, 2015 is a memorable day and a key milestone for the institute and the architecture fraternity as we celebrate the opening of our newly renovated premises @ 79 Neil Road by SIA Patron, Dr. Albert Hong and the return of Archifest, our annual festival to celebrate architecture and the built environment. The New SIA Premises, after a one-year long renovation, had finally come into fruition with lots of brand facilities like the CoLAB, lounge and training room. The festival village for Archifest 2015 was intentionally held at SIA Premises to create more buzz and showcase the bigger and better premises. SIA welcome all members to take advantage of all the new facilities and make this the hub for architects and designers to meet, share and network. August 1, 2016 saw a new beginning for SIA secretariat, with Mr. Fong Hoo Cheong joining the Institute as its new Executive Director and Mr. Ow Chin Cheow relinquishing his duty with effect from March 1, 2017 after 24 years of service to SIA as Executive Director. SIA launched the Archi-Skin Design Competition in partnership with Asia’s premier solid surfaces provider Luxx Newhouse Group in 2017. The Skin is a complex organ that extends as the key interface between the inside and the outside. It also extends inwards and transform into key tissue that in many ways define what the organism is. In Architecture, its “Skin” has a similar role. It protects, it extends, it negotiates with the environment to affect the spatial quality within as well as the urban context without. It can also be an armature and stratum for a multitude of systems. From living systems to system to covey people and services. It also can also swell out to accommodate an in between zone that in itself is another space. In the increasingly complex role in which the urban metropolis plays in natural ecology the design of the Architectural Skin in the urban context becomes crucial. It cannot just be the boundary of an object. It needs to transcend and trans mutate to be relevant. Archi-Skin Design Competition aims to be a platform for the consolidation of the best examples of Architectural skin as well as the place for the ideation of what Skin can be for Architecture.